For as long as I can remember, I have always suffered from dry, irritable skin that becomes red and aggravated easily. Even at the age of 26, I can’t really say I have a go to skincare routine as I like to try new things, just as I do with switching up my makeup. But I wanted to share with you a bit of a routine I appear to have adopted. It includes a couple of repurchases and some new products I haven’t been using for too long but I know I will continue to use moving forward. Something I always use and incorporate into my routine is a micellar water. I feel like it’s ideal for removing makeup and isn’t abrasive on my sensitive skin. 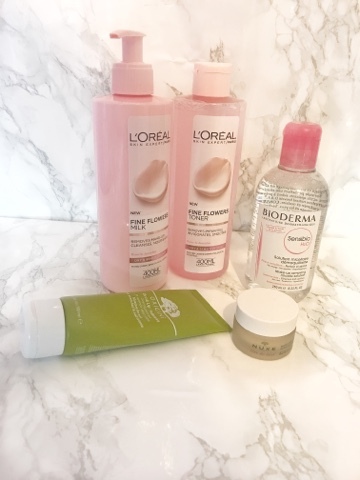 One of the first micellar waters I ever tried was when I was travelling in France and I purchased Bioderma from a French pharmacy. This was maybe 2011 when Bioderma was only available in France and super sought after. Since then, we have seen many drug store brands create their own version of the wonder water but few can get it just that bang on. So I reverted back to the original and purchased a duo pack of Bioderma Sensibio from Boots for a brilliant price of £12.50 (It is normall around the £10.50 mark for one bottle). 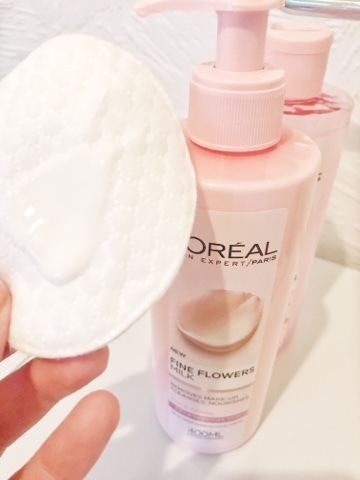 All I do is squeeze some onto a makeup pad (I use the boots cotton wool oval face pads) enough to soak through the top layer, and I hold it on each eye to remove the brunt of my eye makeup. Now I’m left with a slightly smudgy, messy face. Here is where my new skincare saviours come in. 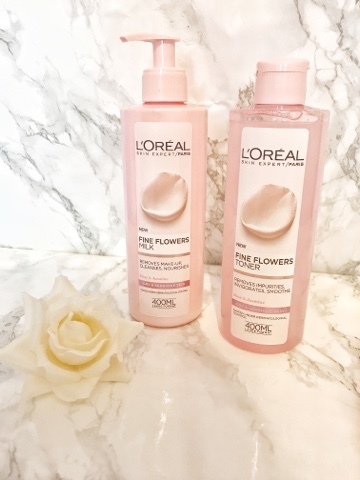 Loreal Fine Flowers is a new skincare range packed with soothing and protecting Rose and Jasmine flower extracts. My sensitive skin was crying out for something that wasn’t going to aggrevate it and let’s be honest - the packaging is pretty dressing table friendly too! There are several products in the range that consists of a cleansing balm/cream, facial wash, a cleansing milk, toner and face wipes. 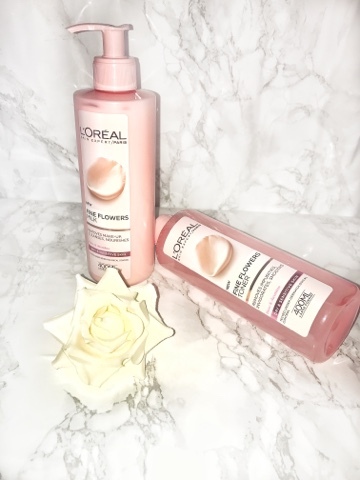 I opted for the toner and the cleansing milk but I do wish there was a face cream or lotion as I don’t believe there is currently (Loreal, please create one if it isn’t already on the cards..). Using another cotton pad, I pump out a 50p sized amount of cleansing milk and apply this directly to my skin in gentle, circular motions so as not to aggravate my sensitive skin. The consistency of the product is light and fairly runny, which I quite like as it doesn’t feel too heavy and suffocating against my skin. I think this is great for normal weekday makeup but if I had heavy duty makeup on I would need maybe two goes with this to fully get a clean base. upwards motion on my neck. I was surprised how lovely it smelt yet didn’t leave that immediate burning sensation or sting against my skin or any breakouts I had. The toner is actually my favourite product because it left my skin feeling incredibly soft and almost left a soft, silky layer over my face. Normally when I have cleansed I am left with a red, patchy looking face and after using this combination my skin had an even tone. So impressed and after a few days of using this morning and night I am feeling very confident it is my new skincare saviour! 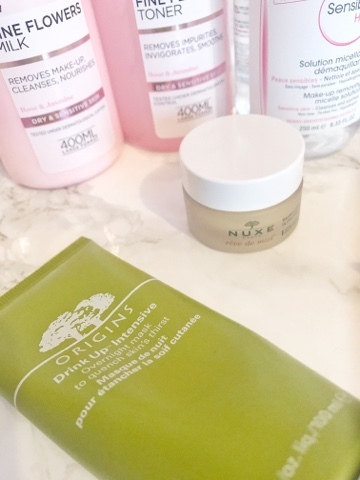 Before I go to bed and have brushed my teeth, I like to apply Origins Drink Up Overnight Intensive Mask to ensure I wake up with super soft, hydrated skin! I have had this mask since January this year after I picked it up at the airport and I’m sadly half way through the tube, because I apply it several nights a week. The mask is packed with skin treats apricot kernel oil and avocado, which are meant to replenish the skins moisture content and quench dehydration within the skin. Alongside this, the mask is anti-aging with the help of Japanese seaweed and is free from any sulphates or parabens. You are meant to be able to leave overnight and tissue off any excess if needed, but by the next morning my skin is soft and ready for a cleanse! 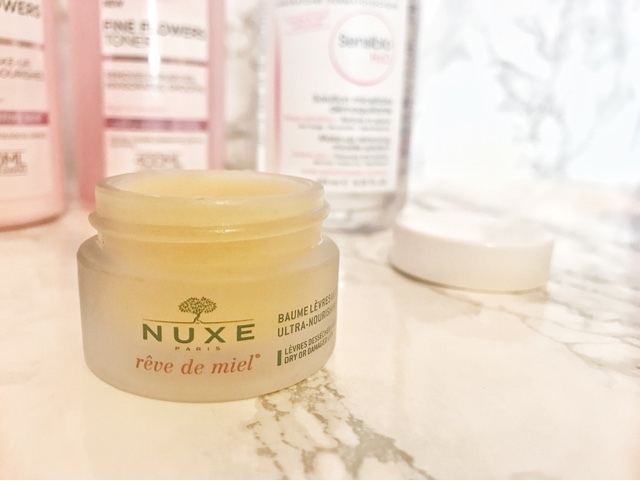 To finish I apply Nuxe Reve de Miel Lip Balm. I purchases this using some Birchbox points I had last month and have finally discovered for myself why it is such a cult product. It is unusual in terms of texture as it is thick and almost wax like. It doesn’t feel greasy or like it sits on top of the lips and a little goes a long way. I enjoy using this under lipstick too as it has a matte finish. The honey, shea butter and sweet almond oil smells divine and is the perfect combination to keep lifts soft.